We’ve got a big edition of the Forza Week in Review – complete with details on this week’s updates for both Forza Motorsport 7 and Forza Horizon 4. 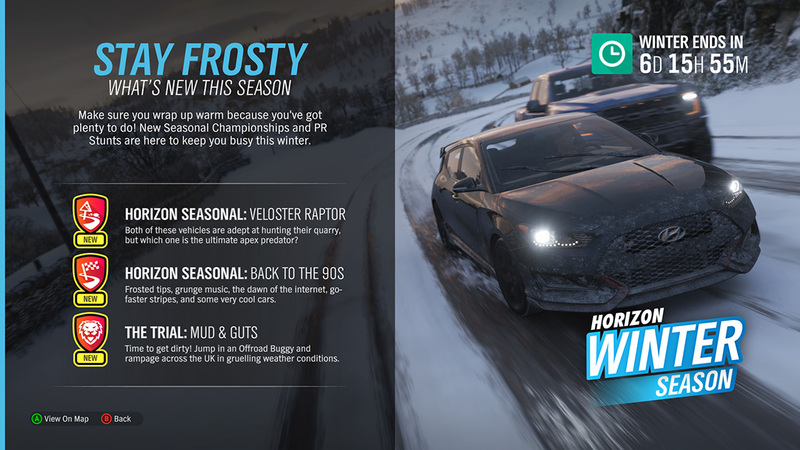 Winter has arrived in Forza Horizon 4 and the new season also bring new cars and events to enjoy. Over in Forza Motorsport 7, we’re kicking off the biggest Bounty Hunter event yet. it’s all here so let’s go! 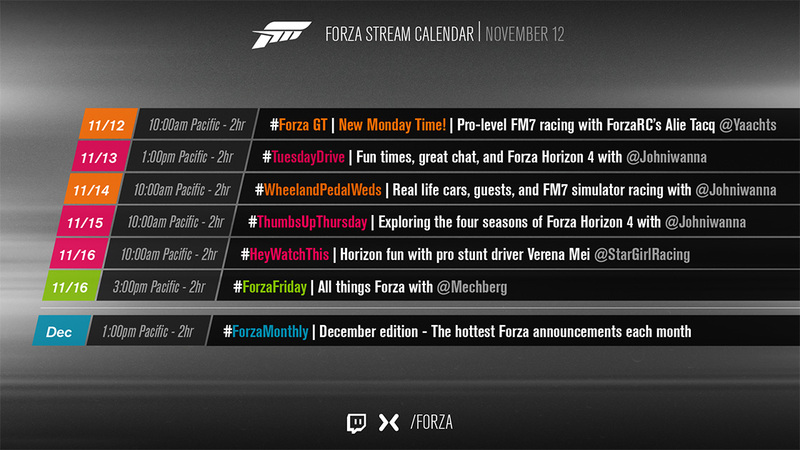 We kicked off the first week of November with our biggest episode of “Forza Monthly” yet. If you haven’t seen our monthly show about all things Forza, then this week’s episode is a great entry point for you. Not only did we dive deep on the details for the November update for Forza Motorsport 7 – including the latest look at our highly anticipated Forza Race Regulations feature – we also welcomed our first guest from Playground Games – principle game designer Mike Brown – to talk about Forza Horizon 4’s route creator feature and give viewers a sneak peek at what’s to come with the next game’s next big update. 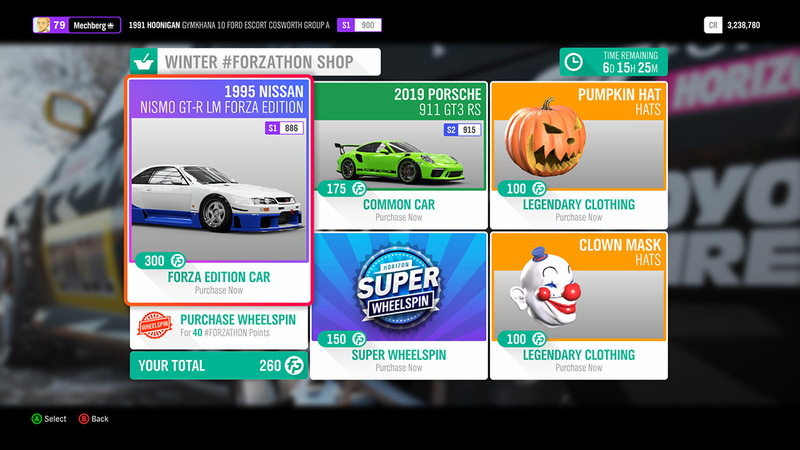 Over in the #Forzathon Shop, there’s great finds, including clothing items and the 1995 Nissan NISMO GT-R LM Forza Edition, as well as the 2019 Porsche 911 GT3 RS, which was the winning car in Playground Games’ recent #Forzathon Twitter poll. Follow Playground’s Twitter feed and look for more polls like this in the future. 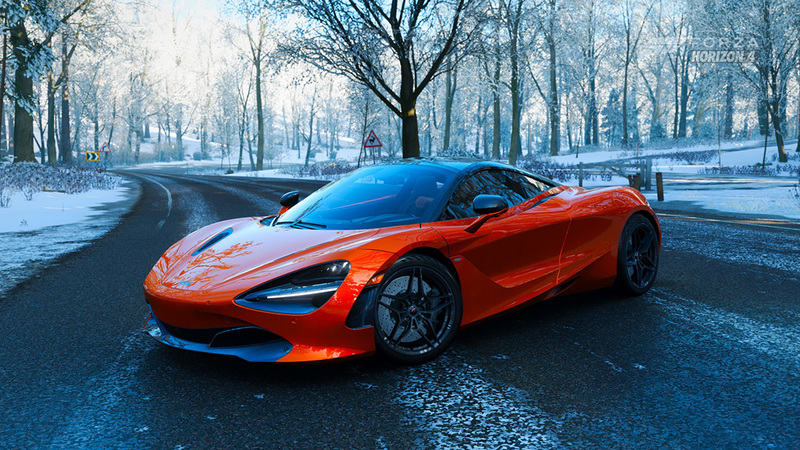 On Wednesday, Playground released the latest update for Forza Horizon 4. Notably, this update fixes the issue where some players were not receiving the “Antique Restorer” achievement, despite having collected the Barn Find. In addition, while in Photo Mode, other players’ cars will no longer appear ghosted. 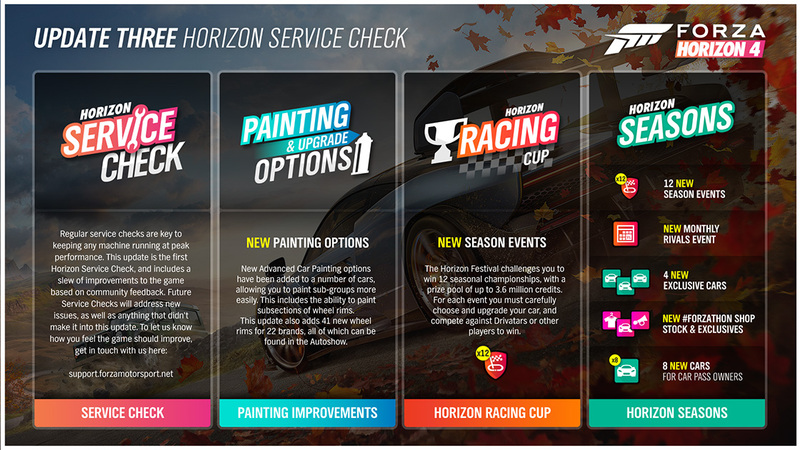 For the full list of improvements made with the November 7 update, see the Release Notes on the Forza Support page. On Tuesday, we launched the latest update for Forza Motorsport 7. This update includes some important and fundamental changes to Forza 7. First of all, the prize crates system has been removed from the game. In its place, we’ve introduced the new Race Shop feature. In Race Shop, players can pick and choose the Race Mods, Driver Gear, and badges they want from a rotating stock of inventory that refreshes every six minutes. You can access the Race Shop from multiple points within the game, including the main menu and from the race lobbies as you wait for the next race to begin. Equally as important is the new collision improvements in the game. In addition to updating our netcode to better handle car-to-car contact in high-latency situations, the Turn 10 team has made some fundamental changes to how cars behave in contact. the team has improved energy dissipation between bodies and also introduced a new Collision Assist setting in single-player or in multiplayer. For more on Collision Assist, check out the story on our November update. After the November update was released, we became aware of an issue where some players would incur 100% damage to their car after hitting a curb on some tracks while using Simulation damage settings. 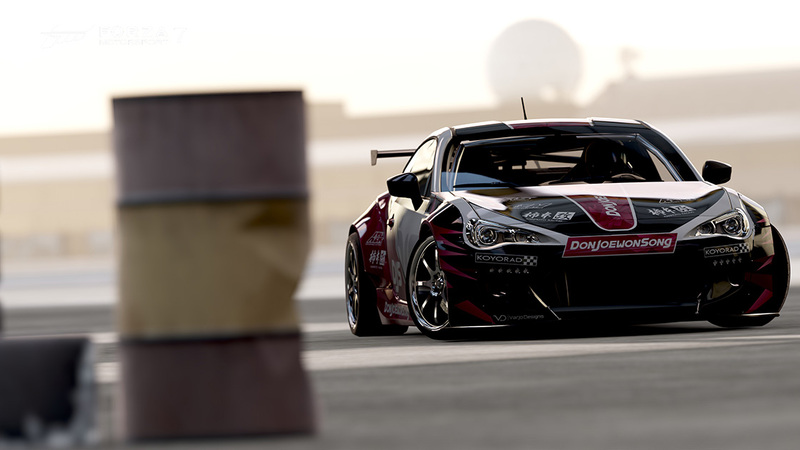 The team has been working to get a fix launched for this bug ASAP; look for more information on the release for fix by following our official Forza Support Twitter handle. Thanks to you all for your patience while we tracked this one down. November’s update also brought in eight new cars to Forza 7 players available for free to all players. In addition to the November Spotlight car – the 1973 Porsche #6 Penske Sunoco 917/30 Can-Am Spyder – we added seven new Hot Wheels cars that celebrate this year’s 50th anniversary of the legendary toy maker. From Hot Wheels classics like the Twin Mill and the Bone Shaker to the 1963 Hot Wheels Volkswagen Beetle 50th Anniversary Edition, there’s something for any Hot Wheels fan to love. Also, be on the lookout for new Hot Wheels Driver Gear suits – including five decade-specific suits you can win for completing events in FM7. See our November update announcement for the details on how you can win each suit. Want to get a feel for the November Spotlight car and win something cool in the process? Hit up the November Spotlight Rivals event – you can find it in the “Featured Events” channel in Rivals mode. Attack Lime Rock in the Porsche #6 Sunoco 917/30 Can-Am Spyder and you’ll get a feel for this epic race car that dominated Can-Am in its day. 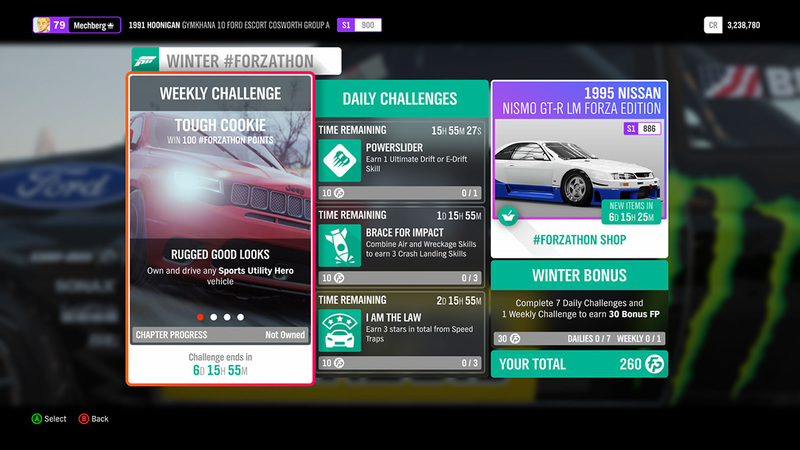 Everyone who sets a time in the race will also win a 1987 Pontiac Firebird Trans Am GTA Forza Edition, which will be delivered to players once the event closes at the end of the month. We’re kicking off this event on today’s episode of #ForzaFriday. I’ll be joined by some of our Bounty guests as they set their initial times in the event and we’ll be chit-chatting as always about the latest news in the world of Forza. If you haven’t noticed, we stream a lot. Like, a lot. In fact, starting next week, we’re going to be streaming every day of the week (and twice on Friday!) Alie Tacq is bringing his Sunday “Forza GT” show to Mondays, to join the rest of the merry band of streamers that populate the Forza channel on Mixer and Twitch. No matter what Forza games you’re into, or how you like to play, we’ve probably got a show for you, so don’t be shy! Pop in and say hello. We don’t bite. Well, *I* don’t bite. I can’t promise anything about Johniwanna. We’re celebrating X018 in Mexico City with a new episode of “Inside Xbox” airing on November 10 at 1 p.m. Pacific on Mixer, Twitch and elsewhere. Look for updates on great games, including Forza Horizon 4 during the show.